Lots of drops, rapids and holes. The main section, which includes the Main Falls, the Double Drop are ideally situated for spectators and photos. Always a good day out. Leave Limerick going towards Dublin. Then take the turn towards Newport (R503). Go through Newport, take the first right towards Murroe for roughly 2km. The take out and best parking is at a parking area at the "Clare Bridge". There are two putins, each can be gotten to by two separate roads that travel upriver parallel to the river. -The first Putin also known as the "long start" that can be can be reached by using the road opposite the car park. Travel up this road until you reach a T junction take a right, proceed until you reach a bridge this is the Putin. Take Out at the bridge beside the car park. The Top Drop waterfall, a straight forward 9 foot waterfall. A drop that require a sudden change of direction to the right midair or upon landing. The Constriction is just below Sidewinder. 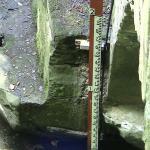 It is a narrow slot, where the river is squeezed into two boat widths. On high water a breaking wave appears at its mouth, this can back loop some lower volume boats. There is a break and then some more generic, but exciting rapids between this and the next section. On high level when you see the foot bridge (or before it) this is where you get out because there are no further get out points until after the Big Eas waterfall. The foot bridge has a sometimes sticky little hole under it just before the rapid that leads into Big Eas. The line is river right though this, hard river right on big water. Rapids leading into Big Eas Waterfall consist of a steepish section just below the footbridge. Then a fast rapid with lots of breaking waves. At the end of this the river turns almost 90 degrees and shoots 15 feet of Big Eas waterfall. Immediately after the plunge pool of Big Eas.Little Eas consists of two slides/drops that drop about 15feet. This can get sticky on high water, inspect yourself each time to get an idea of where the tow back is. Generally running it river right is a safe bet. The rest is fairly technical grade 3 river running, with some rapids/drops. At levels above 0.5 on the gauge the drops below the take out become worth while. The first drop is not very pretty and should be inspected, the are another 3 drops below this which are quite friendly. Take out on river right and walk through fields for 300m to a gate by the road at the noraml take out. These drops are surprisingly worth while but beware of trees on this section. Car's have been broken before. Also the Locals dont like their gates being blocked by parked cars. When parking at the usual put in there is a yard on the right hand side before the rhododendrons. Pull in there but don't block any of the gates. The Meter under the bridge at the car park. Trees. Always inspect the bigger rapids as trees falling across the river are a common occurance.